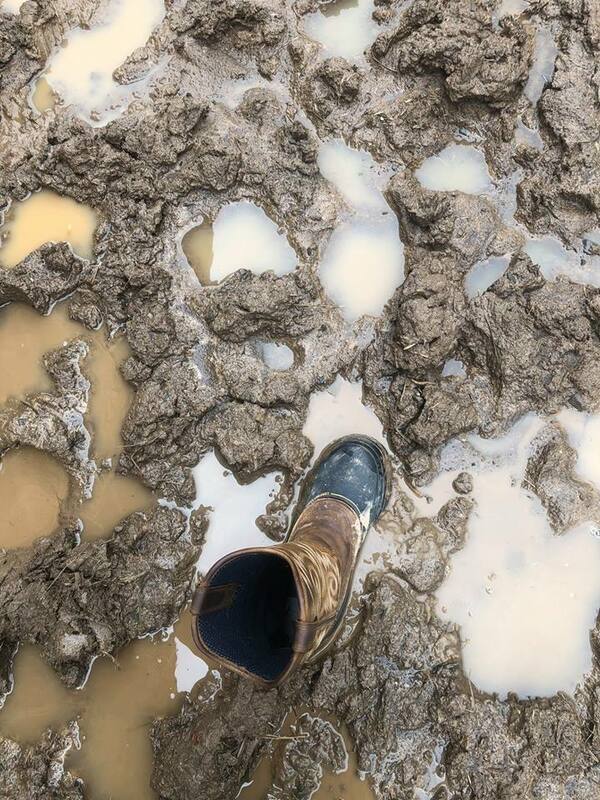 CHARLESTON, W.Va. -- A year of steady rains led to muddy fields across West Virginia, and the wet conditions caused bare ground on farmland and made it difficult for farmers to make and feed hay. Now, farmers with damaged livestock feeding areas can apply for emergency assistance to help revegetate their land with grasses. The State Conservation Committee on Tuesday approved an Emergency Assistance for Revegetation program that will allow farmers on affected lands to apply to their local conservation district for $60 per acre to reseed feeding areas. There is a cap of up to 50 acres per farm. The window of time the applications will be accepted is fairly short, so interested farmers should contact the conservation district in their area. Conservation specialists and technicians with the local conservation district or the West Virginia Conservation Agency will visit the farm, take photos and complete a site visit form to document conditions. Cooperators who receive emergency assistance must follow reseeding guidelines provided by the West Virginia University Extension Service and/or the USDA-Natural Resources Conservation Service’s forage and biomass planting standards. Cooperators will receive payment after the revegetation practice has been verified, receipts and documentation have been submitted, appropriate documents are signed and the local conservation district board approves the payment. Reseeding that a farmer has already done on his own is not eligible for payment after the fact. | In Kanawha County, the Capitol Conservation District. Phone number is (304) 759-0736 and email is CCD@wvca.us. | In Berkeley, Jefferson and Morgan counties, the Eastern Panhandle Conservation District. Phone number is (304) 263-4376 and email is EPCD@wvca.us. | In Braxton, Clay, Nicholas and Webster counties, the Elk Conservation District. Phone is (304) 765-2535 and email is ECD@wvca.us. | In Greenbrier, Monroe and Pocahontas counties, the Greenbrier Valley Conservation District. Phone is (304) 645-6173 and email is GVCD@wvca.us. | In Boone, Cabell, Lincoln, Logan, Mingo and Wayne counties, the Guyan Conservation District. Phone is (304) 528-5718 and email is GCD@wvca.us. | In Calhoun, Ritchie, Roane, Wirt and Wood counties, the Little Kanawha Conservation District. Phone is (304) 422-9088 and email is LKCD@wvca.us. | In Marion, Monongalia and Preston counties, the Monongahela Conservation District. Phone is (304) 296-0081 and email is MCD@wvca.us. | In Brooke, Hancock, Marshall and Ohio counties, the Northern Panhandle Conservation District. Phone is (304) 238-1231 and email is NPCD@wvca.us. | In Grant, Hampshire, Hardy, Mineral and Pendleton counties, the Potomac Valley Conservation District. Phone is (304) 822-5174 and email is PVCD@wvca.us. | In Fayette, McDowell, Mercer, Raleigh, Summers and Wyoming counties, the Southern Conservation District. Phone is (304) 253-0261 and email is SCD@wvca.us. | In Barbour, Randolph, Taylor, Tucker and Upshur counties, the Tygarts Valley Conservation District. Phone is (304) 457-3026 and email is TVCD@wvca.us. | In Pleasants, Tyler and Wetzel counties, the Upper Ohio Conservation District. Phone is (304) 758-2512 and email is UOCD@wvca.us. | In Doddridge, Gilmer, Harrison and Lewis counties, the West Fork Conservation District. Phone is (304) 627-2160 and email is WFCD@wvca.us. | In Jackson, Mason and Putnam counties, the Western Conservation District. Phone is (304) 675-3054 and email is WCD@wvca.us. The mission of the West Virginia Conservation Agency is to provide for and promote the protection and conservation of West Virginia’s soil, land, water and related resources for the health, safety and general welfare of the state’s citizens.